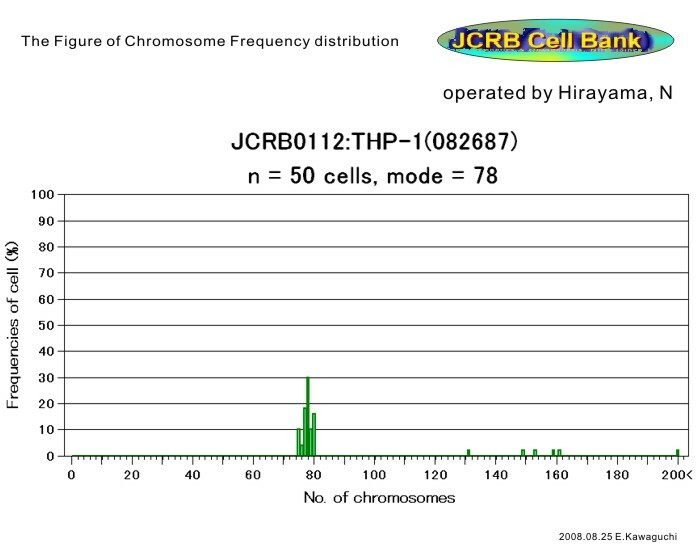 JCRB0112: The developer deposited it to JCRB Cell Bank directly. JCRB0112.1: The developer deposited it to ATCC in US, and deposited same lot to JCRB as reference. The culturing characters of both cells look no deference. Fc,C3b receptors. HLA-A2,-A9,-B5,-DRW1, & -DRW2. No immunoglobulins produced. No EBV. HLA-DR,My 7, My 9, OKM1 positive. Nonspecific esterase positive, Peroxidase negative, a-naftol ASD chloroacetate esterase negative, etc. by Dr. Tsuchiya. Regulation of Fc epsilon receptor expression on a human monoblast cell line U937. Lymphotoxin: induction of terminal differentiation of the human myeloid leukemia cell lines HL-60 and THP-1. Cells of a human monocytic leukemia cell line (THP-1) synthesize and secrete apolipoprotein E and lipoprotein lipase. Induction of functional differentiation of a human monocytic leukemia cell line (THP-1) by retinoic acid and cholera toxin. 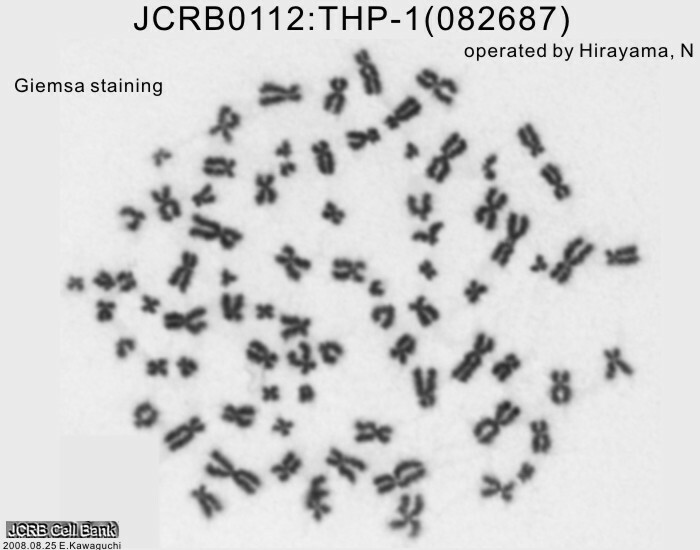 Establishment and characterization of a human acute monocytic leukemia cell line (THP-1). RPMI 1640 medium with 5% fetal bovine serum (GIBCO Cat. # 10099). Please increase FBS concentration to 10% several days after thawing. Expected viability (defrost ampoule) 91 %. Confirmed as human by NP, G6PD (type B), MD, and LD. RPMI1640 medium with 5% fetal bovine serum (at thawing, use 10% FBS). FBS lot used; BioWhittaker 0S069F. Confirmed as human by NP, G6PD (type B), MD. LD. RPMI 1640 medium with 5% fetal bovine serum (GIBCO Cat. # 10091). Please increase FBS concentration to 10 - 20% several days after thawing. RPMI-1640 medium with 5% fetal bovine serum (FBS; Sigma Cat. # 17012). Use 10% FBS until cells stably grow.